San Antonio, TX (TEQUILA.net) - Casa 1921 Tequila announced today the return of its delicious Tequila Cream liqueur to the state of Nevada. 1921 Tequila Cream has won several top awards in various spirit competitions including the Spirits of Mexico and the Agave Spirits Challenge. The most recent was on June 25, 2010, when it was awarded the Superior Gold Medal by the Masters of Taste of the Chefs In America Awards Foundation. It was also named the #1 Tequila Cream Liqueur in the world. 1921 Tequila Cream is made with 1921’s 100% Blue Weber Agave Blanco Tequila, mixed with the soft flavor of cream, vanilla, caramel and cinnamon flavors enhanced with a hint of coffee. It can be enjoyed neat, on the rocks, as a culinary ingredient or in a variety of delicious drink recipes. 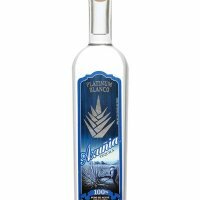 Truly unique in its class, no other Tequila liqueur comes close to its quality and purity, the magic of a perfect blend! Mix all ingredients in a shaker with ice, shake and pour into a chilled cocktail glass. Garnish glass with chocolate syrup.